They say sharing is caring. But when it comes to the closet, anyone with a partner knows this is no easy task. It’s difficult enough to keep your own things organized — let alone your partner’s too! The center island can serve a multitude of purposes — one of which is keeping each of your storage areas separate. 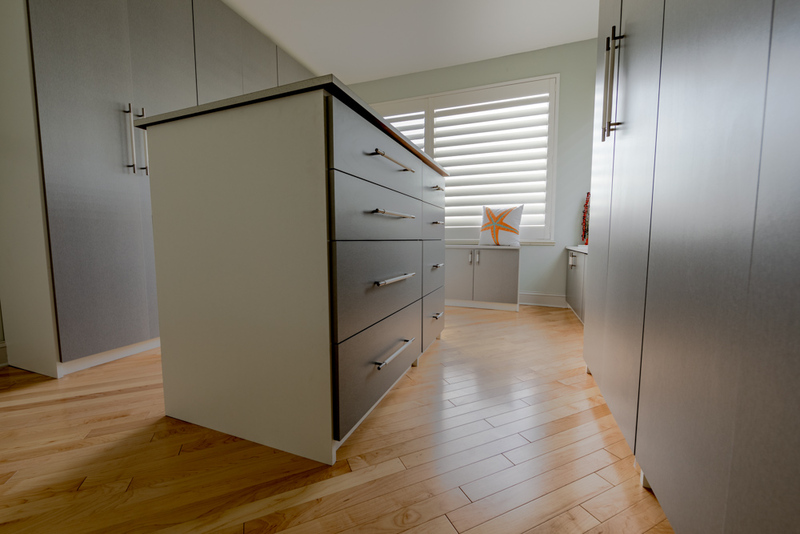 Custom cabinets and drawers within the island will help you organize your items as well as give you more space to lay out what you’re planning on wearing rather than walking in and out of your closet in the morning. This can also be the space where you store shared bedroom items like extra sheets, pillows, towels, etc. 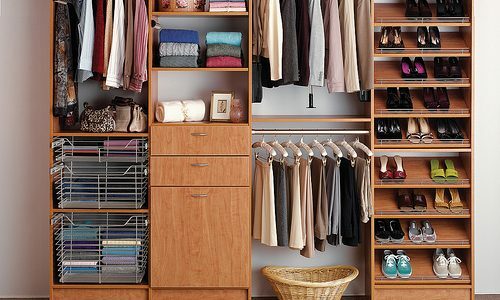 In most closets, side-by-side rod space will work well, and when possible, it’s best to keep the two areas separate. If one of you has more clothes to hang but there’s not enough horizontal space, use your vertical space and consider a pull-down clothing rack. This will allow an additional rod be moved down and back up again with ease without cramping your hanging space. Lastly, keep in mind that both of you have different closet needs. Certainly, it’s a good idea to provide for equal space on either side of your closet. But you shouldn’t automatically go for mirrored-image features. Instead, sit down and figure out what each of you want out of your closet. For example, while one of you may need to hang delicate dress pants or blouses, the other may have more cozy sweaters that need to be folded. Alternatively, maybe one of you wears a lot of jewelry and the other has an extensive collection of shoes. Here at More Space Place, we can help you build a custom closet that meets each of your needs and creates a functional, efficient, and beautiful shared space. 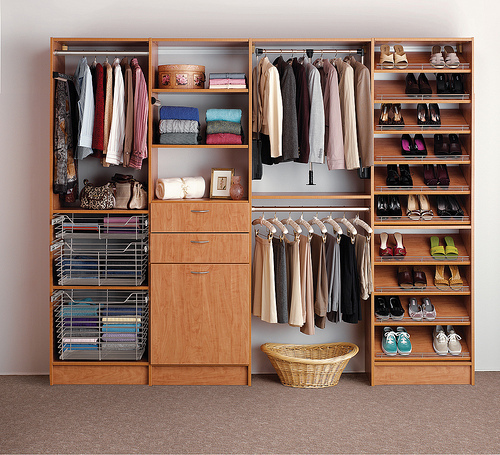 Don’t let a messy, disorganized closet ruin your relationship! Custom closet solutions from More Space Place Jacksonville will help you and your significant other live in closet harmony. Contact us today to learn more about our custom solutions and how they can benefit your closet! We proudly serve the greater Jacksonville area.